Anyone out there who knows me can tell you: I’m a Godzilla fan. There have already been a couple of posts on this site about the King of the Monsters and, with the upcoming release of the new movie (and to celebrate the 60th anniversary) there will be quite a few Godzilla-related posts in the coming weeks. I will do my best to not get totally consumed and post additional articles but… no promises. 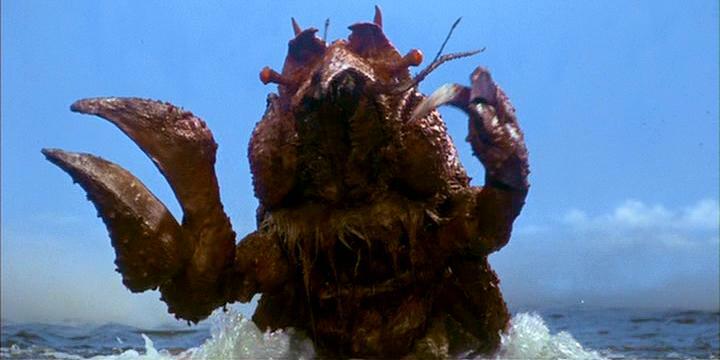 Anyhoo here we go with the first post, focusing on what might be the lamest of Godzilla’s foes. Ladies and gentlemen: Ebirah. It looks goofy because it is. Let the record show: I do not think there really is a bad Godzilla monster. Each is classic in its own way. 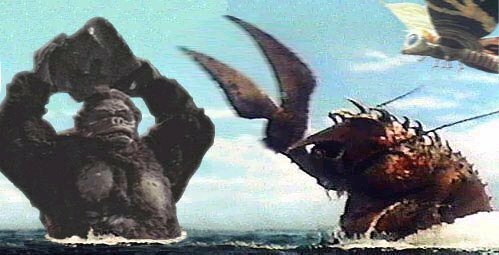 Ebirah (pronounced Eb-E-ra, go ahead and scream it, you’ll sound so cool) may be a giant lobster but works in Godzilla vs. the Sea Monster. Overall, he (or she… who knows what Ebirah’s gender is – let’s go with he) is only lame in concept. This is a creation that never had any hope of beating Godzilla. A giant lobster, seriously? He can’t shoot fire, he can’t fly… he isn’t even that big when compared to Godzilla. None of that stopped Ebirah from being the main villain in Godzilla vs. the Sea Monster. So how did this happen? Did Toho just get lazy with monster creation? Were two producers out to dinner and one was like “this lobster shell is really tough to crack” and the other responded with “you’re a genius!”? The answer is actually an interesting (and unbelievably geeky) piece of monster movie trivia. Godzilla vs. the Sea Monster did not start out as a Godzilla movie. That’s right, the King of the Monsters was actually one of the last pieces added to the script. The film’s original title was Operation Robinson Crusoe: King Kong vs. Ebirah. That’s right… take a moment to enjoy that title, that really is a wonderfully cheesy title. Cause this would have been so less silly. Japanese film company Toho began the project with western film studio Rankin-Bass. Needless to say, there was a (temporary) falling out between the two companies and Rankin-Bass withdrew the rights to King Kong. Toho then had to scramble to find a new leading monster. Lucky for them, they were Toho and had access to what is probably the largest lineup of famous giant monsters EVER, with the obvious highlight being Godzilla. But man, Ebirah splashed him… don’t know how Godzilla will survive that. And Ebirah is defeated for the time being. 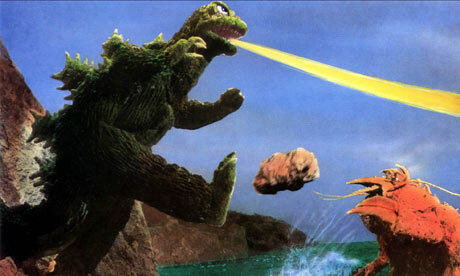 The two fight again and this time Godzilla rips off both of Ebirah’s claws, thus defeating the giant lobster for good. BUT, Ebirah was not done as a Godzilla villain. He would return in (stock footage only) Godzilla’s Revenge (there will be a post on this movie… it is a thing) and again in Godzilla: Final Wars. While not an actual shot from the movie… I feel this fits the tone. In Godzilla: Final Wars, Ebirah would gain the dubious honor of being one of the few (if not the only) monster to be soundly beaten by the military. Yeah, such a mighty monster he is… I hope that next they conquer him with a giant pot and some butter. Ebirah does survive the encounter, only to be killed by Godzilla later in the movie. Ebirah received a shiny new look for Final Wars. In terms of laziness, Ebirah isn’t the only “giant something” that Godzilla fought. There was Kumonga (giant spider), kamacuras (giant praying mantis), manda (giant snake), and most famously Mothra (three guesses what Mothra is). The two giant insects appeared in the same movie (Son of Godzilla) and represent a cool idea – insects are terrifying but tiny after all. Manda and Godzilla never directly fought, Manda is always kind of just there. Mothra… well Mothra has magical Moth-god powers… don’t ask. Ebirah got central billing… he was the main new attraction in Godzilla vs. the Sea Monster. A giant lobster… yeah.